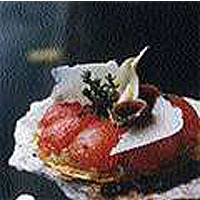 Recipe from Eric Fréchon, Paris. "The tapenade provides a counterpoint for the sweetness of the Roma tomatoes and caramelised onions"
Heat the oven to 180°C/gas mark 4. Roll the pastry out to a thickness of 1.5mm. Cut out six discs of pastry 12cm in diameter. Lay these on greaseproof paper and sandwich between two heavy baking sheets. Bake in the preheated oven for 10 minutes. Blanch the tomatoes then refresh them in cold water. Peel, seed and quarter, then lay them on a baking sheet or roasting pan, drizzle them with half of the olive oil, sprinkle with salt, pepper, 1 clove garlic, thyme and bay leaf. Dry them out in a very low oven (60°C/lower than gas mark 1) for 2 hours, propping the door open with a wooden spoon. Stew the onions very gently in a tablespoon of the oil for an hour. Let them develop a little colour. Deglaze them with the vinegar, then set aside. Shave the parmesan into quite large pieces. For the tapenade, put the second clove of garlic in a food processor with the anchovies and the olives. Blend to a purée with the rest of the oil until thickened. Spread the stewed onions over the pastry discs, arrange the tomato pieces on top like the petals of a flower, and top with anchovies. Sprinkle with the shaved parmesan. Bake in a 180°C/gas mark 4 oven for 3 minutes, arrange on serving plates and surround with the tapenade.